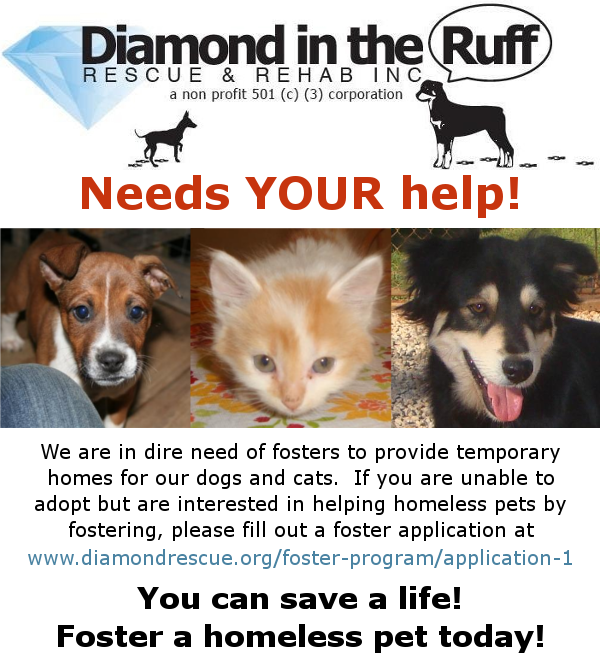 Foster Program - Diamond in the Ruff Rescue & Rehab, Inc.
We are in desperate need of foster homes. We can only help the many animals in need of a "forever home" if we have foster homes available for them. We are forced to turn away many animals in need, each week, due to a lack of space. It's so easy and rewarding to be a foster parent! All you have to do is provide a little space and love for these animals. They will be forever grateful that you gave some of your time to help them while they wait for their "forever home". And in the meantime, you get to have lots of fun with your foster dog assuring them that they will have a safe a secure place to call home one day. We supply EVERYTHING you need to foster: ALL Vetting, Medications (if needed), Collars, Leashes, Food, Bowls, Crates, Toys, Treats, etc. We ask that you treat the foster pets as a family member and bring them to our meet and greet events.